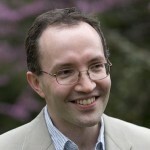 Jonathan Culpeper is Professor of English Language and Linguistics at Lancaster University in the UK. Since early 2009, alongside Professor Neal Norrick of Universität des Saarlandes in Germany, he has held the position of co-Editor-in-Chief of the Journal of Pragmatics (JOP), an interdisciplinary journal of language studies. During this period, the journal has experienced a steady rise in the number of submissions and has sought effective ways to deal with that increase. As he prepares to step down from his editing role at the end of this year, Professor Culpeper and his Publisher, Christopher Tancock, reflect on the changes introduced and their impact on the journal. When I took on my role, it was soon clear that the model of one editor was simply impractical given the number of submissions JOP was receiving, so one of the first changes that Chris (the Publisher) and I made was to introduce more editors. In the months that followed, we added my co-Editor-in-Chief, Neal, followed by two associate editors, a book review editor and a special issue editor. We have recently added another associate editor and having those extra resources has made everything possible. One of the next things we did may sound trivial but I don’t believe it is – we changed the nature of the request letters sent to reviewers. The ones we were using were not optimal in terms of persuasion so I rewrote them to ensure they would be more engaging and personal. I believe this has led to an improvement in the acceptance rate, particularly in the case of invitations to carry out a second review of the same paper – now more than 90 percent of the time the reviewer says yes to a re-review. People have also informally told me that the journal has become politer - that’s quite funny as much of my own research focuses on politeness. Another thing I believe has helped is the introduction of new journal policies and the effective sharing of those policies. I remember that near the beginning, Neal and I were mutually relieved to discover that we think alike. We have the same views on what constitutes pragmatics so it is easy to decide whether a submitted paper is in the remit of the journal. We make sure we keep other editors in the loop and the lines of communication are rapid and efficient. In terms of the kinds of new journal policies we have introduced, a good example is the deadline given to reviewers. It used to be 90 days. Firstly and most importantly, that is longer than the norm, and seemed to be having a negative effect on the amount of time the reviewers were taking. Secondly, it is expressed in days. Can you imagine a time period of 90 days? So, we reduced the amount of time and changed the expression - it became six weeks, and then more recently five. We were a little nervous about whether fewer reviewers would be available in that shorter time period, but those worries proved unfounded. We always provide feedback on every paper we reject so that the scholar has the opportunity to improve it. We also now have the opportunity to suggest the article is transferred to another journal, the recently-launched Ampersand. We might choose this option when the submission is good but it’s not quite right for our journal, for example, it is out of scope or does not have the weight we are looking for. 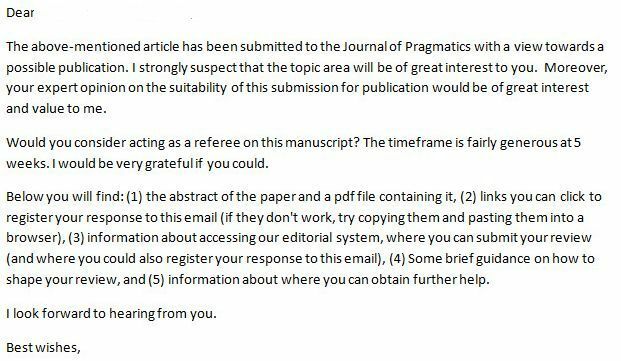 This can happen before or after the review process on Journal of Pragmatics – if it is after, the review reports are transferred along with the manuscript. While Ampersand can, of course, still reject the paper, I see this as a great move forward for authors, editors and reviewers. Once Neal and I were settled into our roles, our Publisher suggested we did an editorial to announce our arrival and I thought I would look at the keywords for the papers being submitted to get a feel for the field – it was really interesting to see what the popular themes were. Two to three years later, we decided to refresh the journal’s aims and scope – the ones we had been using were drawn up when the journal was launched in the late 1970s and were no longer entirely relevant. We knew from that early editorial what we needed to update and were able to tweak the terminology accordingly. I think that has also had a positive effect – the scope for submissions is now much clearer. 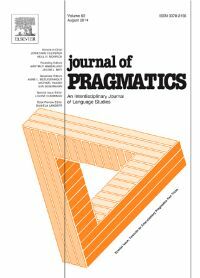 I’ve been managing the Journal of Pragmatics for almost a decade now and have been really pleased with how the journal has developed and grown. As Jonathan says, from 2007 onwards, JOP was really struggling under the weight of the submissions it was receiving; in essence, its popularity was becoming a burden. The challenge was to consider how to manage the submissions without jeopardizing JOP’s emphasis on quality or its proud traditions. One of my main concerns was that with only one editor working on the journal, the turnaround times for processes (e.g. getting a paper into review or recording a decision on that paper) had begun to slow down considerably. Authors were starting to be affected by this. 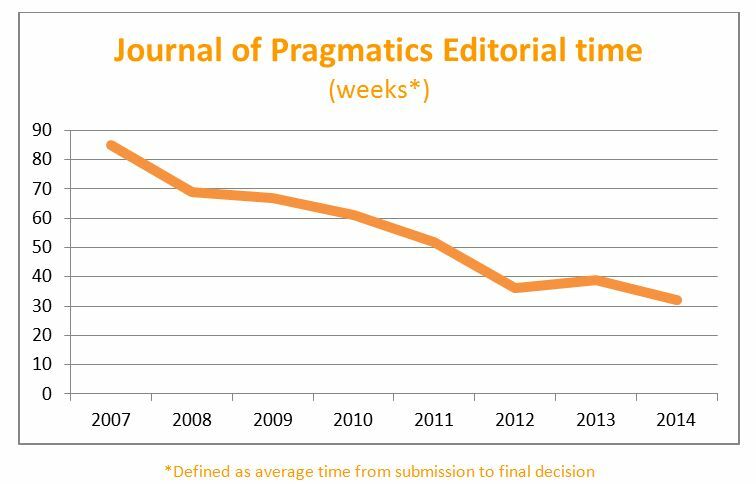 Enlarging the editorial team was an immediate success and, as the graphic below demonstrates, the editorial time for the journal has dropped year on year so that we’ve now reached a point where JOP is one of the faster journals that I publish, despite having the most submissions. The 62 percent increase in speed between 2007 and 2014 speaks for itself and is an eloquent testament to the efforts of Jonathan, Neal and the rest of team, as well as the work of the editorial office run by Journal Manager Sara Bebbington. As well as the changes to the editorial team, we also made some other adjustments which I believe have had a very beneficial impact on the journal and have undoubtedly improved the experience for authors. One thing we did – which might sound contradictory – was to become more hard-nosed about revisions. This is one area where things tend to slow down significantly which is strange since obviously it’s in an author’s interest to deliver a revision promptly and thus keep the submission moving along smoothly. Setting and policing a (reasonable) deadline for revisions (120 days for initial revisions and 42 days for subsequent revisions) has definitely had a good impact. We have made two further changes; we have increased the number of journal issues published, providing more ‘slots’ for publication, and we have introduced article-based publishing. As a result of these two initiatives, an author’s accepted paper will now be published online within an average of 6 weeks and will appear in paper form within just 16 weeks. In 2008, those figures were 7 weeks and 24 weeks, respectively. While we welcome these really positive steps forward, I, Jonathan, his successor and the rest of the team on JOP, plan to continue developing the journal and striving to further improve the experience for authors and readers. Jonathan Culpeper is Professor of Linguistics and English Language at Lancaster University, where he is a member of the largest Linguistics department in the UK, placed 9th in the QS World rankings. He specializes in the study of language use in context, that is, pragmatics. Between 2006 and 2009 he held a prestigious three-yearESRC Fellowship to study impoliteness. He is the author of 13 books and many papers. Christopher Tancock has nine years’ experience in STM publishing. He joined Elsevier in early 2006 where he initially managed social science book projects before moving to journals. He is now Senior Publisher for Linguistics and History of Science, managing some 20 journals including the prestigious Journal of Pragmatics and Lingua. He has degrees in European Studies and Linguistics from Royal Holloway and the University of Oxford respectively and is based in the Oxford office. In his ‘spare’ time, he manages the Oxford City Division of St John Ambulance and is qualified as a Patient Transport Attendant.